Ethiopian Airlines, the largest Aviation Group in Africa and SKYTRAX certified Four Star Global Airline, has launched three new flights to Kisangani and Mbuji Mayi in the Democratic Republic of the Congo (DRC) and Nosy-Be in Madagascar today, March 27, 2018. 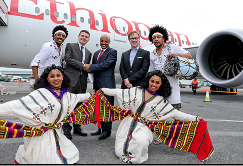 The launch of the flights was announced by Group CEO of Ethiopian Airlines, Mr. Tewolde GebreMariam, at an inaugural ceremony attended by H.E. Prof. Alain Tehindrazanarivelo, Ambassador of the Republic of Madagascar, H.E. Mr. Victor Mwania, First Secretary of the Democratic Republic of Congo and other invited dignitaries. �We are very happy and proud to be a very strong instrument in connecting Africa in line with our motto of the last 70 years - Bringing Africa together and closer to the rest of the world. When we open these three destinations, we may look at only the direct services we are going to operate between Addis and these destinations. But what is more important and may not be visible is that we are connecting these destinations with more than 100 destinations all over the world. Kisangani and Mbuji Mayi will be two additional points to the already three points we fly in the DRC; so we are now flying to Kinshasa, Goma, Mbuji Mayi, Kisangani and Lubumbashi. With the launch of the new flights, Ethiopian now serves 58 destinations in Africa and more than 100 destinations globally, solidifying its stature as a veteran Pan- African airline with the largest number of destinations in the continent. Ethiopian Airlines (Ethiopian) is the fastest growing Airline in Africa. In its seventy plus years of operation, Ethiopian has become one of the continent�s leading carriers, unrivalled in efficiency and operational success. Ethiopian commands the lion�s share of the pan-African passenger and cargo network operating the youngest and most modern fleet to more than 100 international passenger and cargo destinations across five continents. Ethiopian fleet includes ultra-modern and environmentally friendly aircraft such as Airbus A350, Boeing 787-8, Boeing 787-9, Boeing 777-300ER, Boeing 777-200LR, Boeing 777-200 Freighter, Bombardier Q-400 double cabin with an average fleet age of five years. In fact, Ethiopian is the first airline in Africa to own and operate these aircraft. Ethiopian is currently implementing a 15-year strategic plan called Vision 2025 that will see it become the leading aviation group in Africa with seven business centers: Ethiopian Regional Services; Ethiopian International Services; Ethiopian Cargo Services; Ethiopian MRO Services; Ethiopian Aviation Academy; Ethiopian In-flight Catering; Ethiopian Ground Services and Ethiopian Airports Enterprise. 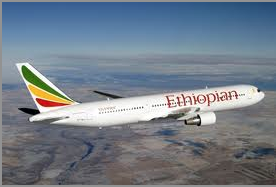 Ethiopian is a multi-award winning airline registering an average growth of 25% in the past seven years. Ethiopian Airlines, the largest airline in Africa, is pleased to announce that it has finalized preparations to start flights to Dublin and Los Angeles starting from June 19, 2015. Ethiopian flights to Dublin and Los Angeles will be operated three times a week with the ultra- modern Boeing 787 Dreamliner, which offers unparalleled on-board comfort to passengers. The flights will be the only direct service connecting Africa with Ireland and the West Coast of the United States. Travelers from Los Angeles and Ireland will be able to enjoy seamless and convenient connectivity options thanks to Ethiopian extensive network in Africa covering 49 destinations. Similarly, as the flights will be the only direct service between Dublin and Los Angeles, the Irish and U.S. travelling public between the two cities will greatly benefit from the opening of the route. Our new flights connecting Addis Ababa, Dublin and Los Angeles will play a critical role in the expansion of trade, tourism investment between the fast growing continent of Africa, and the United States and Ireland. As the these flights will be the first and only direct air route linking Africa with Ireland and the West Coat of the U.S., they will bring these two seemingly far away cities much closer to Africa and will facilitate mobility and connectivity for businesses and the large African Diaspora community living in the West Coast of the United States. �In line with our Vision 2025 strategic roadmap, we are expanding our network and deploying the most technologically advanced aircraft as part of our commitment to our customers to provide them the best possible travel experience and connectivity options. Our flights to Dublin and Los Angeles will be operated with the B787 Dreamliner, which offers unmatched on-board comfort especially for such a very long haul route with its unique features such as greatly reduced noise, higher cabin air humidity, biggest windows in the sky and spacious cabin interior. �said CEO of Ethiopian Airlines Group, Tewolde Gebremariam. With the addition of Dublin, the airline�s 11th European city and Los Angeles, its 4th point in the Americas, Ethiopian international network will cover 87 destinations across 5 continents. ￼Ethiopian is a Pan-African global carrier voted by passengers as the Best in Africa for two years in a row by Passenger Choice Awards, the most comprehensive survey in the industry. The airline operates the youngest fleet in the continent with an average of less than 7 years and currently serves 85 international destinations across 5 continents with over 200 daily departures. Individuals and groups which have argued that the success of any airline in Africa rests on its mode of ownership must have been proved wrong by the success story of Ethiopian Airline, a national carrier from the same Africa. It is no longer news of that the airline has proved cynics wrong that what they have described as a hopeless situation in air transportation in Africa is actually not totally hopeless. This was the position of the Vice President of the airline, Mr Esayas Woldemariam, during a chat with some journalists at the Lagos Airport at the weekend. According to Woldemariam, while the success of any carrier was not necessarily dictated by mode of ownership, rather, the success of such a carrier should depend on the ability of its management or owner to develop a multi-hub system that would create a pool of network to feed passengers from different parts of the continents into its major hub before distributing them to the global network. Besides this, Woldemariam emphasised that success of any airline could be achieved by putting in place a good route analysis structure that would address the lack of air connectivity on the continent through the development of multiple hubs to feed passengers traffic into a major network across the continent. Woldemariam, who took time to speak on what makes the airline thick in the midst of unimpressive performance of other African carriers, said until African governments implemented the liberalisation of its air transport policy, also called the Yamoussoukro Decision, which grants free access to carriers from the continent to fly into any airspace on the continent for connectivity, foreign carriers would continue to dominate the market with their over 800 per cent market share of passengers. The success of the African carrier can be seen in its route network that cuts across the globe with the use of sophisticated aircraft with their average age put at seven years. The airline according to statistics has been able to lay other foundations through where the government of the country has continued to sustain itself. The success story of the airline must have rubbished the position of many Nigerians who had argued that the government was never a good manager of businesses. According to some players in the sector, if Ethiopian Airlines, fully owned by the government, could do so well, nothing could stop other countries on the continent, including Nigeria, from doing same. The overwhelming performance of the airline, due to the managerial capability of those put in charge, has been made possible by the free hand given to the professionals to run it without undue interference. The airline, apart from the goodwill it enjoys from its government, has also been able to embrace global trends, such as cooperation, as witnessed in its alliances with airlines across the world, which has further given it the mileage to spread its tentacles outside Africa. While the alliances have helped many airlines to survive the harsh economic situations, reverse has been the case with the Nigerian airlines, which, despite all pleas, have chosen to remain separately without any progress. Ethiopian Airlines Vice President attributed the woeful performance of African airlines to the inability of the respective countries to put in place a dedicated and honest management team, which should see air transport as a tool to integrate the economic development of the continent rather than the ongoing argument that the failure of the African carriers was because they were owned by government fully. He said because Africa was not easily connected by rail and road modes of transportation, air transportation, therefore, becomes the cheapest mode to connect all parts of the continent for accelerated economic integration development. To Woldemariam, many African carriers failed because they did not invest enough in route development and adequate equipment to leverage their operations as major players in the global air transport industry. He said investment in smaller carriers by major national airlines, as Ethiopian Airlines had done with ASKY Airlines in Lome, Togo, and Air Malawi in Lilongwe, had assisted in the development of two regional hubs in West, Central and Southern Africa, which, he said, had allowed the airlines to feed passengers into the major hub in Addis Ababa. With the multiple-hub system, Ethiopian Airlines, he said, was able to connect passengers from different parts of Africa into its global route network as a Star Alliance member. �The solution to how to deliver successful airlines in Africa is not a matter of the mode of ownership. African carriers have failed not because they were owned by the government or privately run. It was because the airlines lacked diligent managers who had the autonomy to run the carriers with industry discipline. �African carriers can do well if the right template is in place and one of the ways of achieving this is through the multiple-hub system. This system allows the carriers to put in place a passenger feeder network from its smaller hubs into a major hub for global passenger distribution. Africa needs successful carriers which it could use to facilitate its economic integration. This has become key, because the continent is not connected by rail or road. Air links could strengthen businesses in Africa with low level investment in infrastructure,� he said. Currently, Ethiopian Airlines is the largest and most successful African carrier by revenue and profit, according to the International Air Transport Association (IATA), the global clearing house for standard airlines across the world. The Star Alliance member airline currently operates direct flights into four cities in Nigeria: Lagos, Abuja, Enugu and Port Harcourt, making 20 weekly flights into the country. Ethiopian is currently implementing a 15-year strategic plan called Vision 2025 that will see it become the leading aviation group in Africa with seven business centres: Ethiopian Domestic and Regional Airline; Ethiopian International Passenger Airline; Ethiopian Cargo; Ethiopian MRO; Ethiopian Aviation Academy; Ethiopian In-flight Catering Services and Ethiopian Ground Service. WASHINGTON, D.C. � Ethiopian Airlines announced that its CEO, Tewolde Gebremariam, has been elected to the International Air Transport Association (IATA) Board of Governors. IATA is a trade association for the world�s airlines. Its 240 airline members comprise 84 percent of the world�s total air traffic and its Board of Governors consists of top executives from 31 airlines from around the world. Mr. Gebremariam will join Presidents, Chairmen, and CEOs of some of the world�s largest airlines, further placing Ethiopian Airlines at the forefront of the airline industry. �I am delighted to join my distinguished colleagues on the IATA Board of Directors,� said Gebremariam. This appointment is recognition of not only Gebremariam, but also of Ethiopian Airlines. The airline has more than 7,000 staff members, one of the industry�s most up-to-date fleets, and service to 72 international destinations. Addis Ababa, Ethiopia - (WIC) � As Air Transport is irreplaceable to connect African Countries to one another and with the rest of the world African States need to give a serious attention to the sector, Ethiopian CEO Tewolde Gebremariam. In his exclusive interview with WIC, the Chief Executive Officer emphasized that the continent needs to have Common Aviation Policy to facilitate the profitability of African Airlines. Africa should take European Union as a model in developing its Aviation Industry, he said, adding that it has managed to enable its Airlines to move freely within the continent. According to the Chief Executive Officer, in Europe if one of the European member countries negotiates with any country outside the European Union, all member countries are allowed to fly to that country. This is, however, impossible in Africa, Tewolde added. According to Tewolde, Ethiopian Airlines can�t, for instance, fly from Addis Ababa to France via Chad or Khartoum due to lack of such Common Aviation Policy in the continent. According to the Chief Executive Officer, focus is not given to the sector in many African countries as a result the marketing is segmented, the inter Africa traffic is very low, not many Airlines are serving and trade among African countries is only 10 percent. Both road and train transport in Africa are underdeveloped, Tewolde said, adding the only appropriate and irreplaceable transport to connect African countries is air transport; however, it is taxed heavily even more than alcohol and beverage in some African countries. The CEO also advised African countries to construct their infrastructure so that it will be easy for African Airlines to connect African countries with the rest of the world. In this regard, Tewolde appreciated the Ethiopia government that it has done its best level to develop the sector. It has constructed 17 Airports among which 15 are asphalted; however, most African countries do pay attention to Air Transport infrastructures, the CEO added. Despite the fact that African countries need to pay due attention to Air Transport and subsidize the Aviation Industry to make it profitable, we found things on the ground different, WIC learnt. According to the Chief Executive Officer, the price of jet oil in Africa is more than doubled to the world update and Airlines are taxed in the continent very high even more than the taxation for cigarette and alcoholic beverage in some African countries. These challenges could be alleviated if Africa Airlines manage to have a single marketing aviation like the Europeans through liberating the traffic rights, The CEO added. It would be appropriate for African countries to carry out the agreed, signed and filed Common Aviation Policy to liberalize the traffic rights some 20 years ago, Tewolde emphasized. Addis Ababa-based Ethiopian Airlines is the national airline of Ethiopia. One of the leading airlines on the African continent, Ethiopian Airlines serves more than 60 international destinations across Africa, Asia, Europe, The Middle East, and North America, as well as operating an extensive domestic and international cargo network. 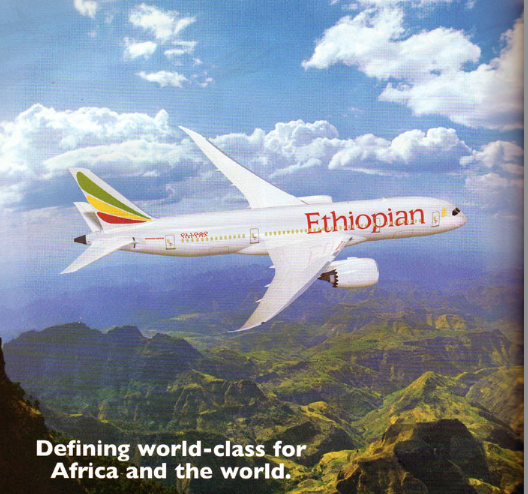 Ethiopian Airlines became a member of Star Alliance in Dec-2011. By Capa Aviation. WASHINGTON, DC – Ethiopian Airlines, the fastest growing airline in Africa, announced further expansion of its unparalleled service to the continent with new flights to Blantyre, Malawi, and Ndola, Zambia starting March 31, 2013. Blantyre is the commercial and industrial capital of Malawi. It will be Ethiopian Airlines’ 44th destination in Africa and the second in Malawi next to Lilongwe. 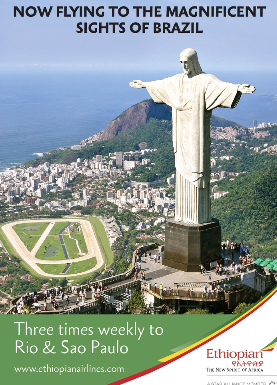 The new schedule of 3 flights per week will begin on March 31, 2013. Ndola, the third largest city in Zambia, is the industrial and commercial center in the copper belt of the country. Ndola will be Ethiopian's 45th African and the 72nd international destination. It will also be its second destination in Zambia next to Lusaka. The new schedule of 3 flights per week will begin on March 31, 2013. “Ethiopian, as a flagship carrier of Africa, is pleased to add Blantyre and Ndola to its wide route network and to offer passengers to and from these cities the best possible connectivity through its Addis Ababa hub,” said Tewolde Gebremariam, CEO of Ethiopian Airlines. 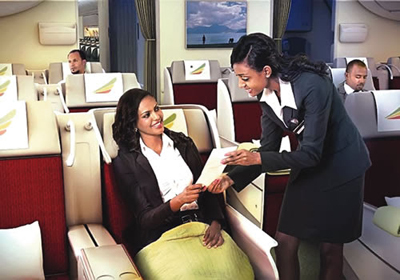 Passengers traveling to and from Blantyre and Ndola will enjoy smooth connections to destinations in Ethiopian Airlines' route network such as Washington, DC; Toronto; London; Hong Kong; and Dubai; among many others. Ethiopian Airlines was founded on 30th December 1945, initially with the contractual assistance of TWA. The first planes used by the Airline were five DC-3's. The first international scheduled service was inaugurated between Addis Ababa and Cairo on April 8, 1946. Ethiopian Airlines, www.ethiopianairlines.com, one of the largest and fastest growing airlines in Africa made its maiden flight to Cairo in 1946. The airline currently serves 50 destinations around the globe, 30 of which are in Africa. The addition of services to Kuwait and Riyadh will bring the total number of the Airline's international destinations to 52. Ethiopian will be the first carrier to operate the Dreamliner-B787 in Africa, the Middle East and Europe. In 2006 and 2007 Ethiopian has earned three different awards respectively from the African Aviation Journal, the African Times/USA, and the Government of Ghana for its best performance in the commercial air transport industry. Now I won't pretend to be a complete stranger to the airline; a friend at ATA, Hagos Legesse of New York, made me a gift that I have treasured ever since. Born in Ethiopia, Mr. Legesse is a well respected travel consultant and served as an ATA Director for many years. This timely gift was a deluxe coffee table edition of "Bringing Africa Together," a book that tells the story of humble beginnings, followed by the rise of Ethiopian Airlines to world status, through decades of trials and tribulations, peace and war. The addition of direct flights to Addis Ababa from Washington, DC and New York/ Newark, is the latest feather in the airline's cap. If all of this tender loving care (TLC) I spoke of wasn't enough, on our return flight I was presented with a beautiful silk necktie compliments of the airline. I've worn it with pride at every opportunity ever since. This colorful piece of wearable art bears a replica of a classic stained glass window that adorns the United Nations Conference Center in Addis Ababa. The design is by the artist Tekle (see his profile in this issue). Having pioneered a mighty "Air Bridge to Africa," Ethiopian Airlines now flies to more African destinations than any carrier in the world. See the above map above for a quick idea of its routes to and from the continents. From what myself and colleagues have experienced in my first return flight, I am sure that Ethiopian Airlines will continue to influence people and win friends for generations to come. 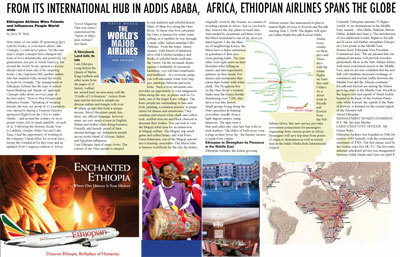 Read more about Ethiopian Airlines in our Fall Edition and on our Web Site.